Acquired directly from the artist by Paul Rosenberg & Company, New York. Acquired from the above by Albert D. Lasker, New York on 29 November 1949. The Lefevre Gallery, London (9026). Anon. sale, Christie's London, 2 December 1991, lot 3. 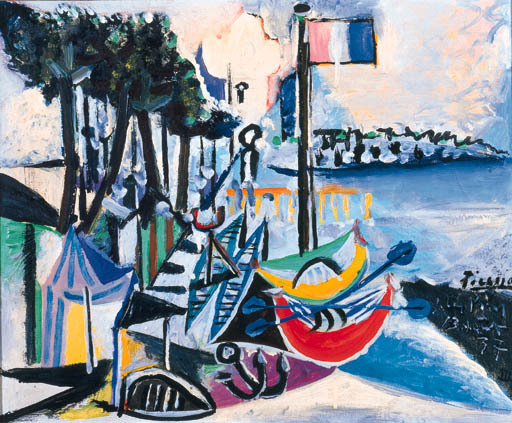 J. Cassou, Picasso, Paris 1946, p. 45 (illustrated in colour as Bateaux à la plage). Das Kunstwerk, Baden Baden 1951, p. 63. W. Brockway & A. Frankfurther, The Albert D. Lasker Collection-from Renoir to Matisse, New York n. d., pl. 34 (illustrated). C. Zervos, Pablo Picasso, oeuvres de 1932 à 1937, vol. 8, Paris 1957, no. 374, (illustrated p. 182). The Picasso Project, Picasso's Paintings, Watercolour, Drawings and Sculpture - A comprehensive illustrated catalogue 1885-1973, Spanish Civil War 1937-1939, San Francisco 1997, no. 37-179 (illustrated p. 73). New York, Knoedler Galleries, Impressionist Paintings, January 1951. Dallas, Museum of Fine Arts, Paintings from the collection of Mrs Albert D. Lasker, March 1953, no. 53. This exhibition later travelled to San Francisco, Palace of the Legion of Honor, March-April 1954. New York, Marlborough and Saidenberg Galleries, Hommage à Picasso, October 1971, no. 50 (illustrated on the cover of the catalogue). Painted just two weeks after the completion of the mural Guernica on 13 August 1937 the celebratory atmosphere evoked in Paysage is in sharp contrast to the violent tension which characterises the political works with which Picasso was occupied during the first half of the year. On completing Guernica towards the end of July, Picasso closed his Paris studio and drove down to Mougins for a summer holiday; in his Hispano-Suiza with Dora Maar, his recently acquired afghan hound, Kasbec, and his painting equipment. They stayed at the Hôtel Vaste Horizon in Mougins with Paul and Nusch Eluard. The hotel was full of Picasso's friends and he was happy in the unpretentious and relaxed atmosphere there. He was able to enjoy Eluard's company which always infused him with new and poetic ideas. Picasso had been visiting the South of France every summer since 1919. He loved the sea, as it reminded him of his childhood in Malaga. Although he usually stayed inland at Mougins, he would visit the beach in the mornings with his friends and his dog, searching the shore for pebbles and shells and frequently swimming in the warm mediterranean sea. As Roland Penrose commented: "The small neat well-built physique of Picasso was at home in these surroundings. His well-bronzed skin, his agile controlled movement, his athletic figure and small shapely hands and feet seemed to belong to the Mediterranean scene as though he were the reincarnation of the hero of an ancient myth." Commenting on the discovery of a bleached ox's skull on the beach (see fig. 1) he continues, "With his usual delight in disguises Picasso, closing his eyes, posed for Dora to take his photograph, holding in one hand the skull and in the other a staff such as he had put into the hand of the blind Minotaur" (R. Penrose, Picasso: His Life and Work, London 1958, p. 280). In the present work, the pervasive atmosphere of sun, sea and pine trees together with the relaxed leisure of a mediterranean summer is re-inforced by the brilliant colours of the boats, flag and beach hut. In characteristic style, the boats are arranged in a triangular composition; delineated by thick black brushstrokes and filled with contrasting bright reds, yellows, greens and blues, completely unassociated with the grief and tragedy present in Guernica. This disposition of shapes on the surface derives its source from Cubism and turns the boats into an assemblage of forms which as a whole have a unique coherency and lyricism.